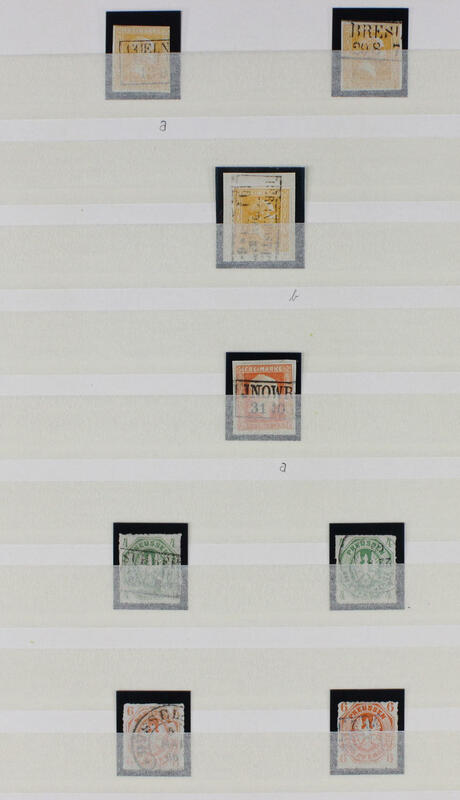 949 /⊙/ Postwar Germany - collection in the Schaubek illustrated album, as well American/British Zone with ribbon and net overprints, buildings, export fair souvenir sheet, French zone from of the general issue, Baden 3. 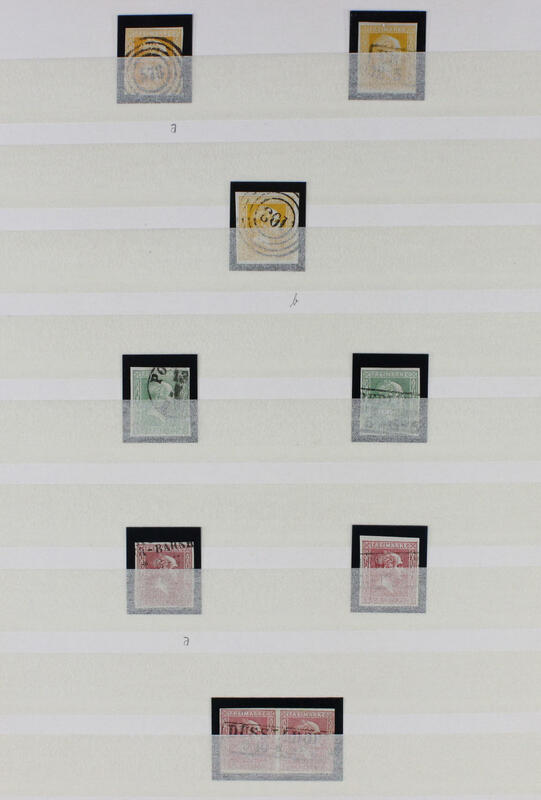 Postage stamps set complete, good special stamps, Saarland 1947 / 59 without souvenir sheet pair otherwise almost complete with all welfare sets, Council of Europe 1950 and so on. 2299 /⊙/ Postwar Germany - extensive special collection the worker issue in a large thick stockbook accommodated with numerous values allied occupation, American/British Zone and Soviet Zone. 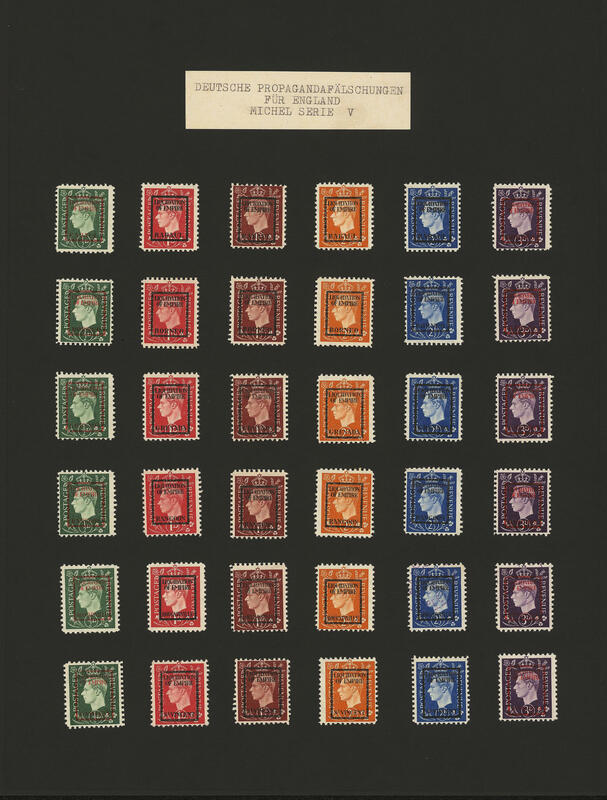 As well the allied occupation with numerous colours and minor shade, blocks of four, upper margins with plates and rotary printings, printer sign and so on. 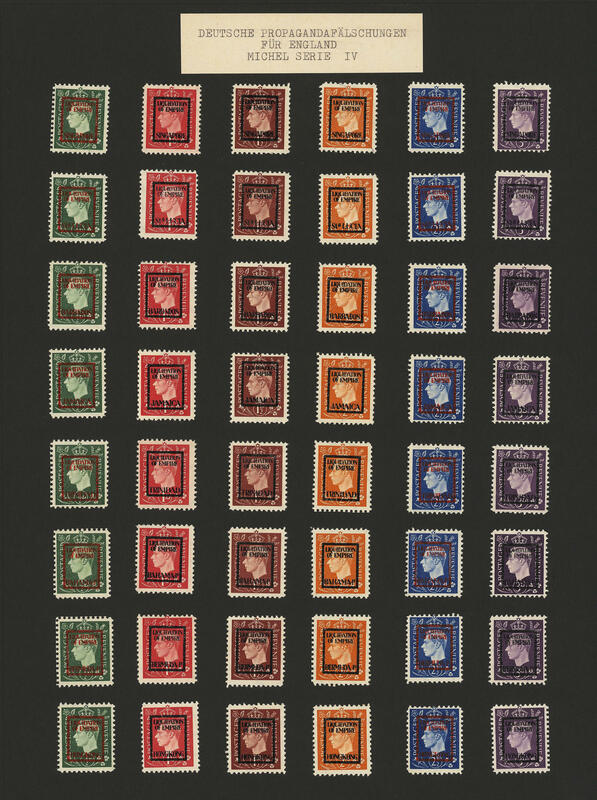 Also the American/British Zone is extensively present with ribbon and net pattern overprint including color shades and upper margins, as well the Soviet Zone with numerous hand stamp overprints, partly expertized, as well machine overprints. An extensive object this attractive issue! 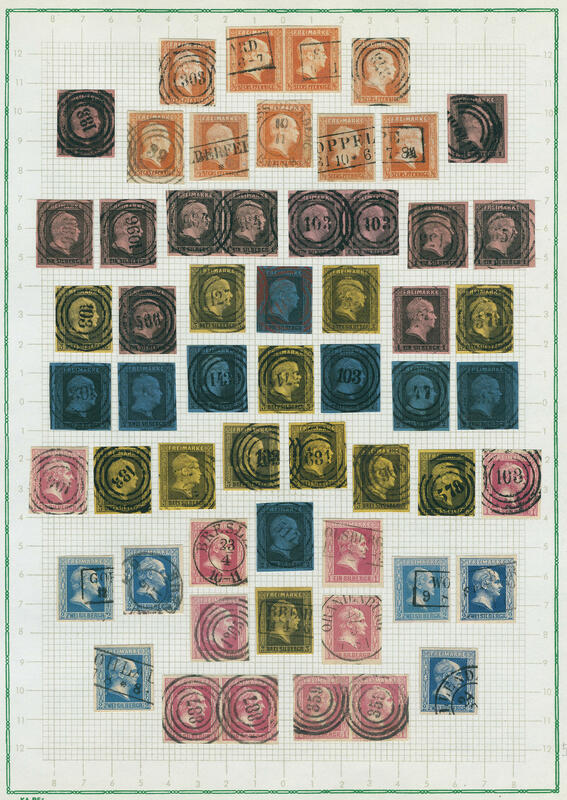 2429 x Postwar Germany - extensive inventory on old American preprinted pages accommodated, mixed quality, as well numerous better issues, Federal Republic of Germany with numerous beginning valued, with also 30-90 Pfg. Posthorn unused, German Demokratic Republik (East Germany) with numerous first issues, as well an extensive part Berlin with many beginning valued, better sets, French zone with red cross sets and so on. Very favorable valued! 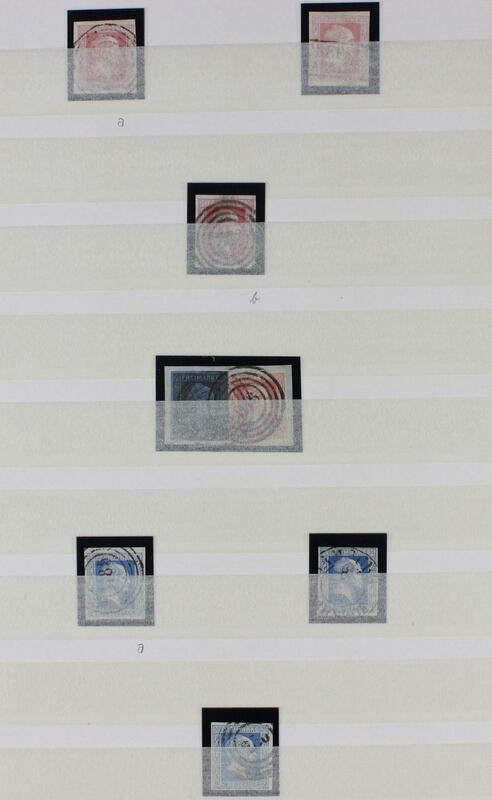 62 German wartime and propaganda forgeries II. 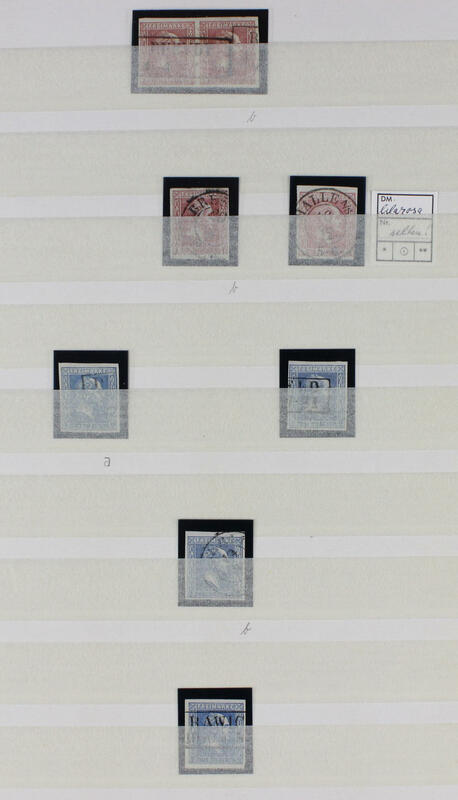 World war - German forgeries for Great Britain, fantastic collection the 4. And 5. 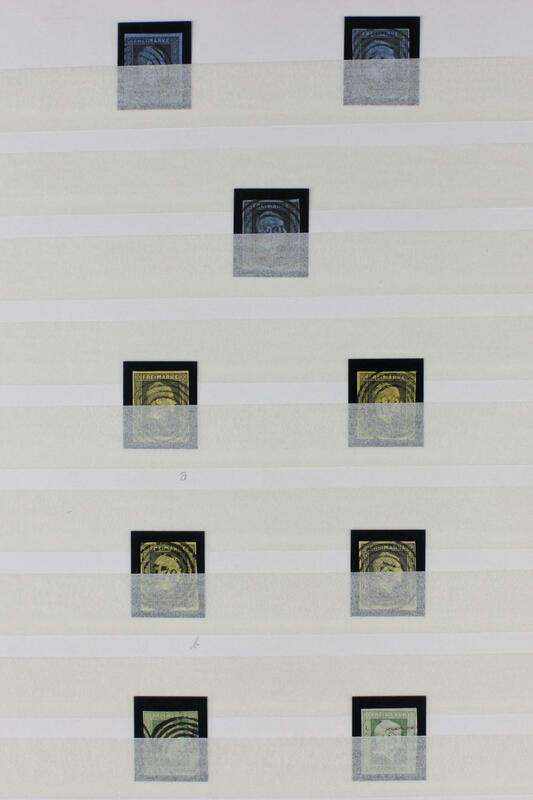 Overprint sets complete unused, as issued on ungummed paper in the Lindner ring binder. The collection includes all 14 sets complete. 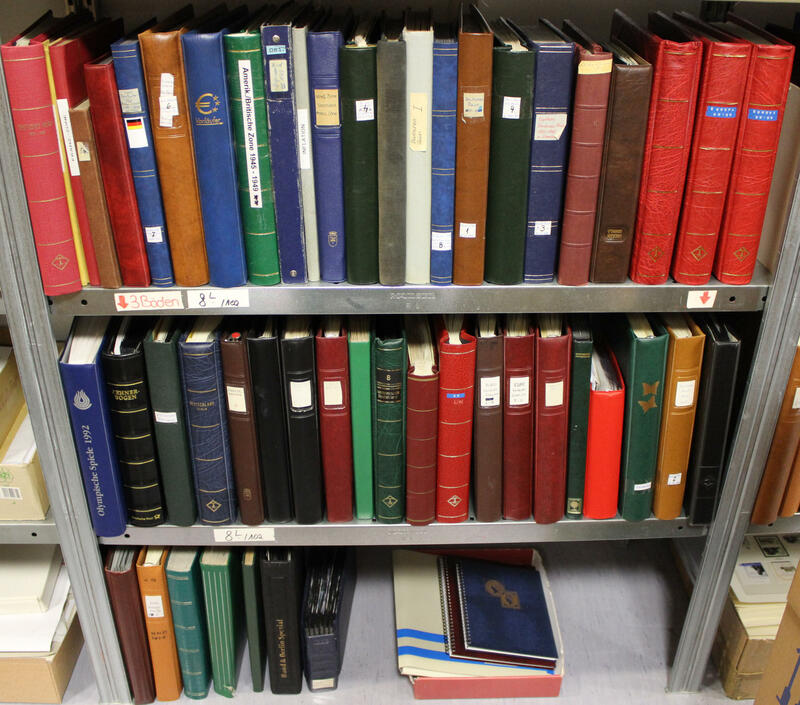 In this completeness become these sought-after and undervalued sets almost never offered. An exception object! 2981 ✉ Prisoner of war mail - huge inventory from approximate 1200 prisoners of war letters, mostly free of postage transported from the seventies and octogenarian years to the last prisoner of war of the II. World war in Italy mister Major Walter Reder and lieutenant colonel Herbert Kappler with the corresponding note / cancellations. Additional still numerous further documents to this subject. All in two filing cabinets accommodated. Unique inventory this historic interesting documents. Perfect for liquidation for wholesale dealer and so on. (former starting price: 3000,- €). 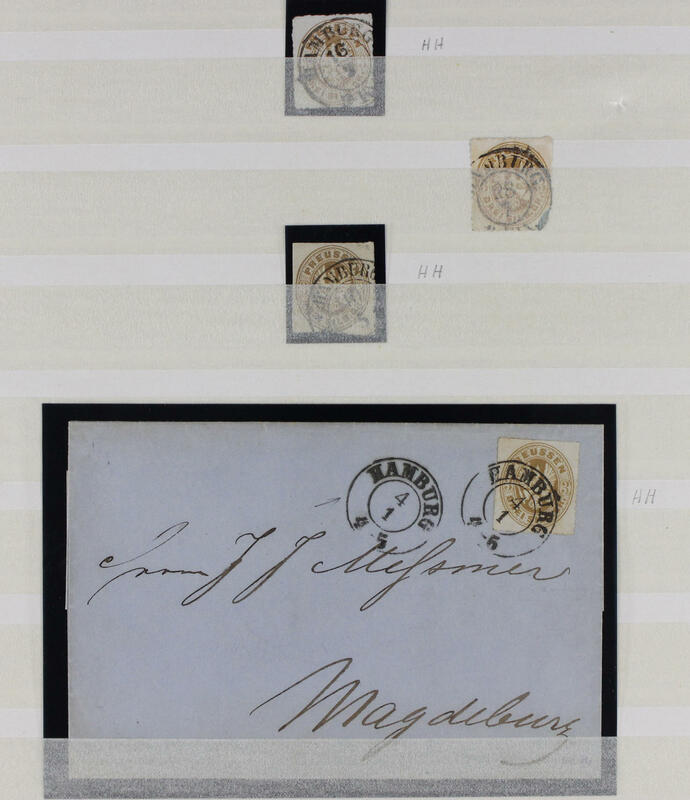 22J ✉ Prussia - interesting and extensive inventory from approximate 220 covers and postal stationery from the head issues, as well interesting documents and cancellations, also prephilatelic documents and offical letters, as well still used postmark on North German Postal District. Please have a look! 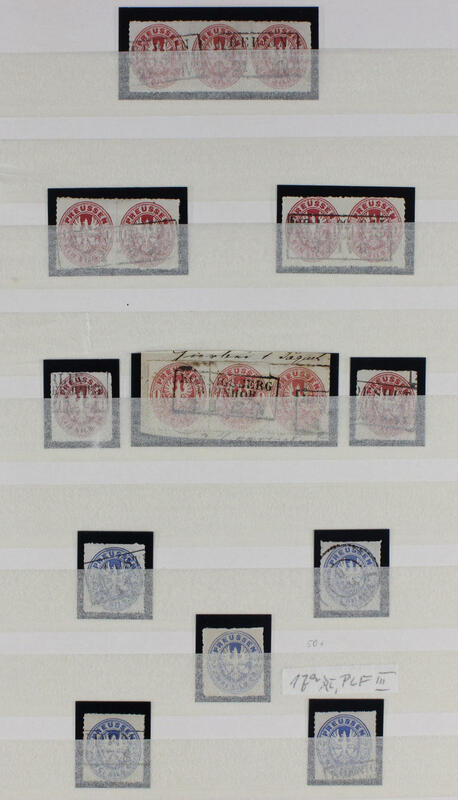 98 ⊙/∆/ Prussia - interesting and rich collection in a large stockbook clean formed, slightly mixed condition, with numerous superb and extremely fine copies, beautiful postmarks, different number cancel, color shades, pairs and strip of three and so on. A magnificent object! Michel approximate 4000,- €. 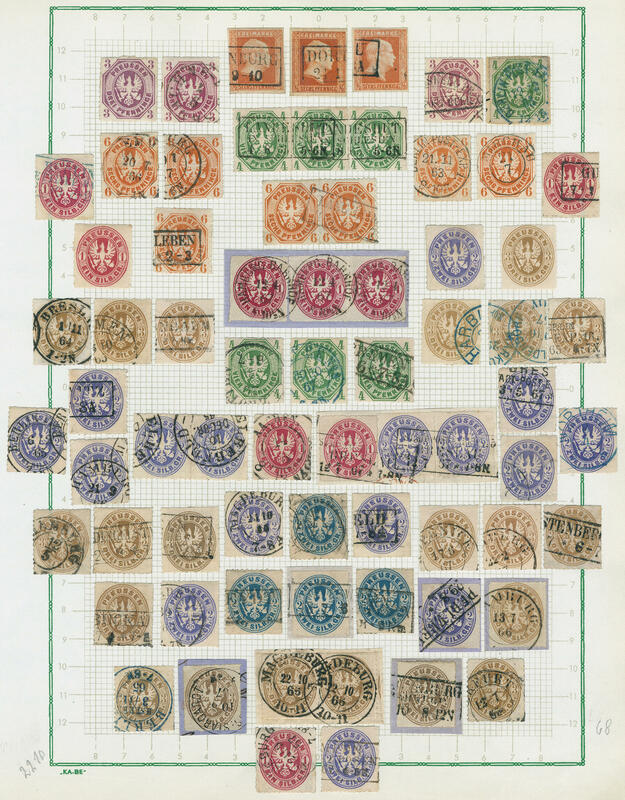 313 ⊙ Prussia - interesting collection on Lighthouse form, mixed quality, with superb pieces, as well cephalic and coat of arms stamps, as well also the indoor service values, almost exclusively used collected. Very high catalog value! 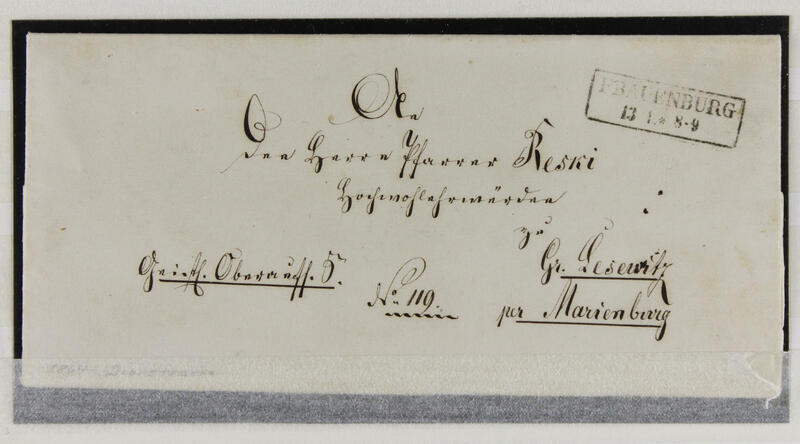 1024 ⊙ Prussia - rich collection, except for two values complete on printed form, used respectively on letter pieces formed, mixed quality, with superb pieces. 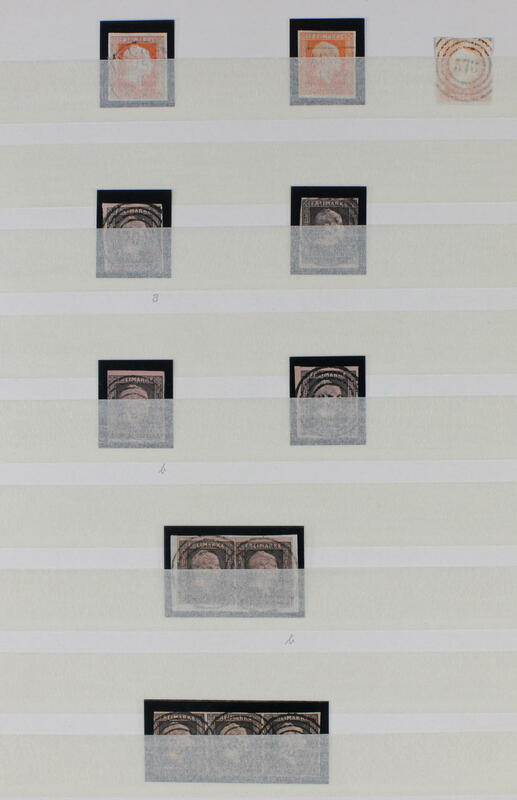 With also all head stamps, both stamps for internal usage, 1- 6 Kreuzer and so on. 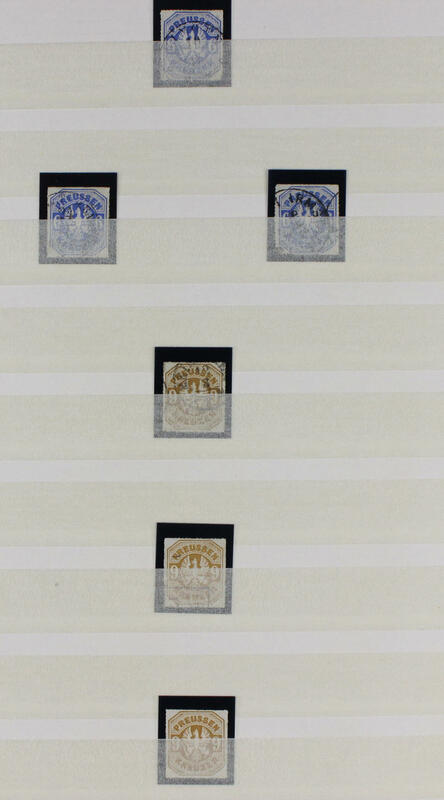 1052 ⊙/ Prussia - almost exclusively used collection, in the number of a major listing complete on KABE hingeless printed form with useful issues, additional also with color shades and so on. Very high catalog value! 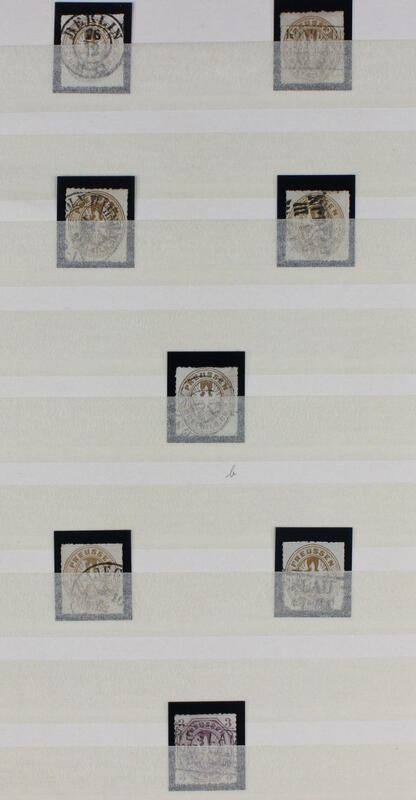 1399 ⊙/ Prussia - rich collection on KABE hingeless preprinted pages with useful issues, more then complete formed, mixed quality, as well numerous cephalic and coat of arms stamps including Kreuzer values. Very high catalog value! 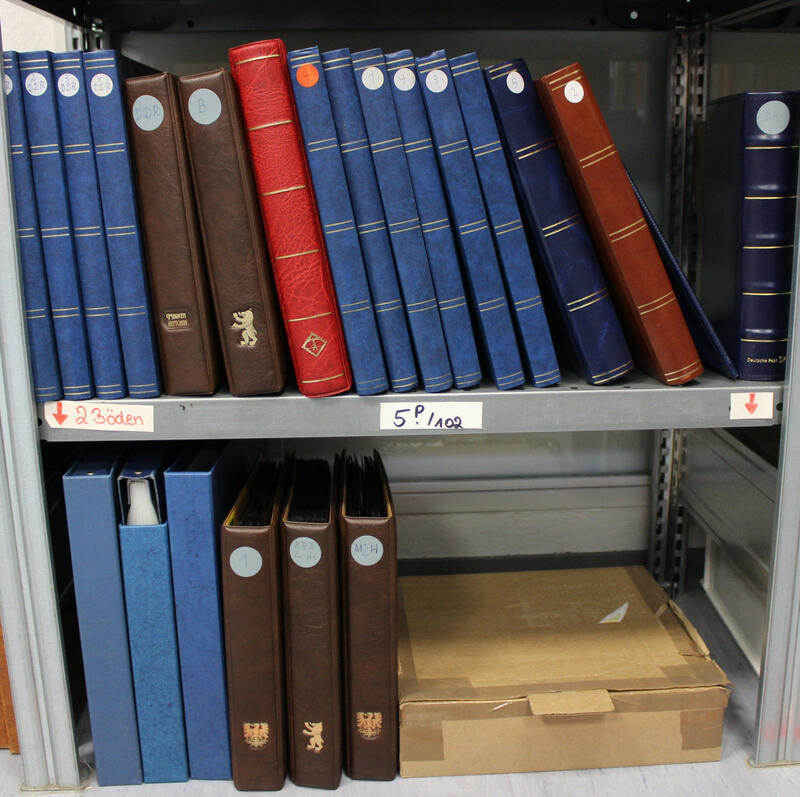 2J rack Rack - with a rich inventory of collections and lots. 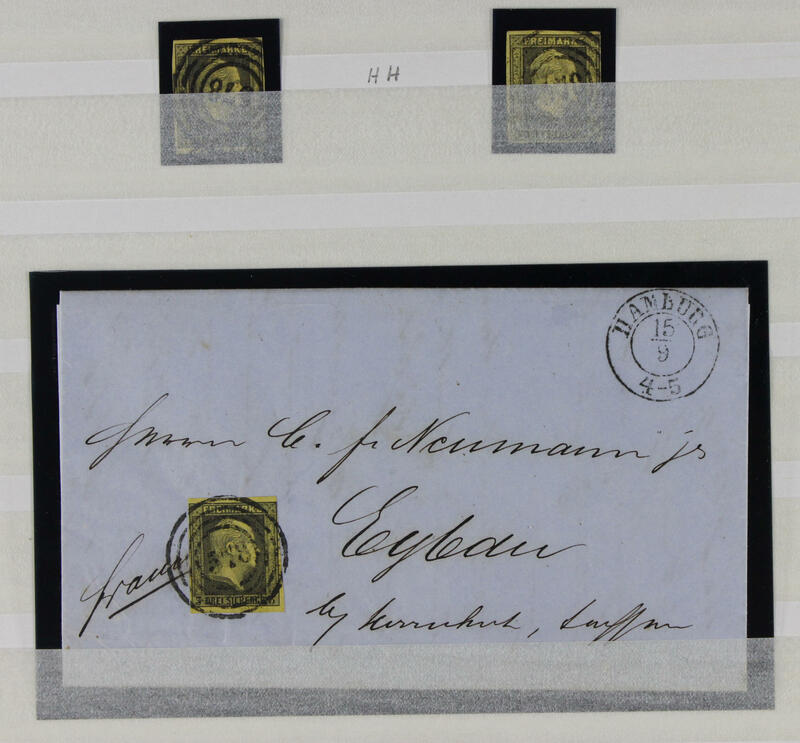 As well Federal Republic of Germany mint never hinged with all beginning valued, herewith the posthorn set even double, 30 Pfg. 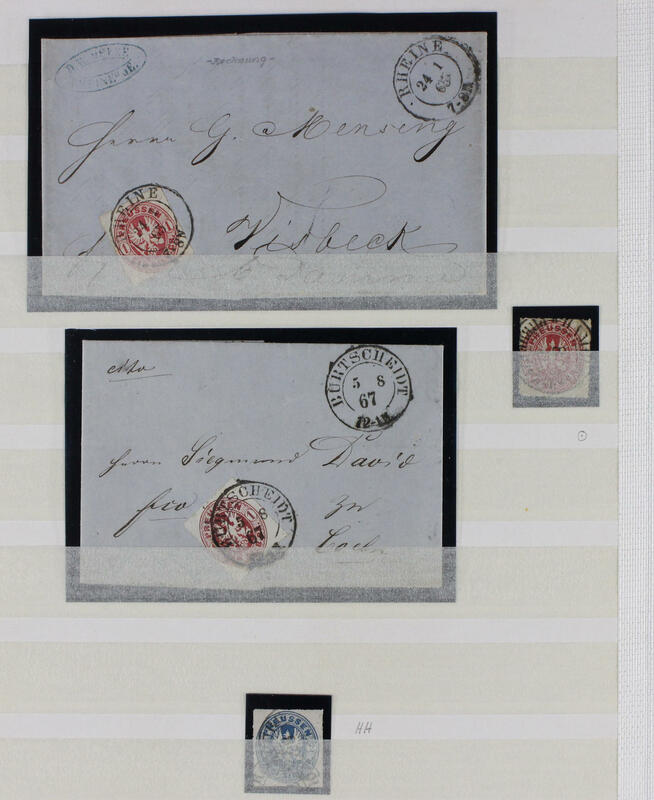 Stephan in the corner margin pair with corrected sheet number, Berlin complete mint never hinged, German Demokratic Republik (East Germany) mint never hinged with all first issues, a nice lot of letters, Europe union mint never hinged, Zeppelin reminder documents and so on. Please have a look! 5P rack Rack - with an interesting inventory collections and lots, as well rich used collections postwar Germany, where the issues in question were not evaluated. Also a strong part se-tenants Federal Republic of Germany and Berlin exist. With also Berlin monetary sovenier sheet with special cancellation and photo expertize Schlegel BPP, monetary reform vitims set with photo certificate Schlegel BPP and much further material. Please check carefully and calculate! 7T rack Rack - with a rich inventory of collections and lots in 52 large albums and stock books accommodated, as well issues from Germany and Europe, including a thick Schaubek album with issues of different areas, as well much Germany, with also Federal Republic of Germany in the hingeless illustrated album with a lot of material and further areas. Very favorable! 8L rack Rack - with an extensive inventory collections and lots of different areas, as well Berlin with all beginning valued, German Reich with useful issues, herewith also stamp booklet sheet / parts of sheets, issues from Europe and oversea, with also an interesting part PeopleÂ´s Republic of China and so on. Must see! 10N rack Rack - with an interesting and abundant inventory collections and lots in 16 albums and stock books accommodated. As well interesting collections including Germany, as well German occupation II. World war, Federal Republic of Germany with good first issues, Berlin, Soviet Union and so on. Very favorable! 11K rack Rack - with a rich inventory of collections and lots. 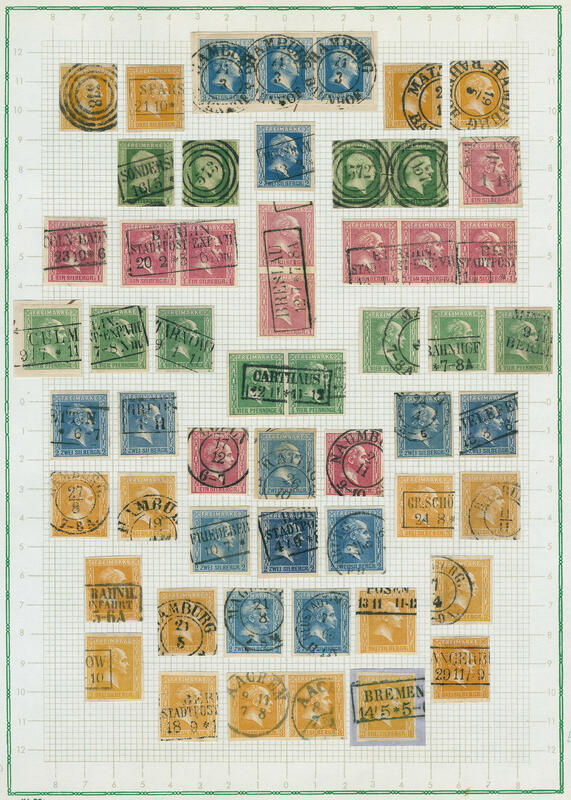 As well allied occupation / American/British Zone with useful issues, Federal Republic of Germany used including the beginning valued, as well duplicate stocks of different areas, Federal Republic of Germany and Switzerland stamp booklet including post valid issues and so on. Please have a look! 13A rack Rack - with a rich inventory of collections and lots of different countries in albums and boxes accommodated. 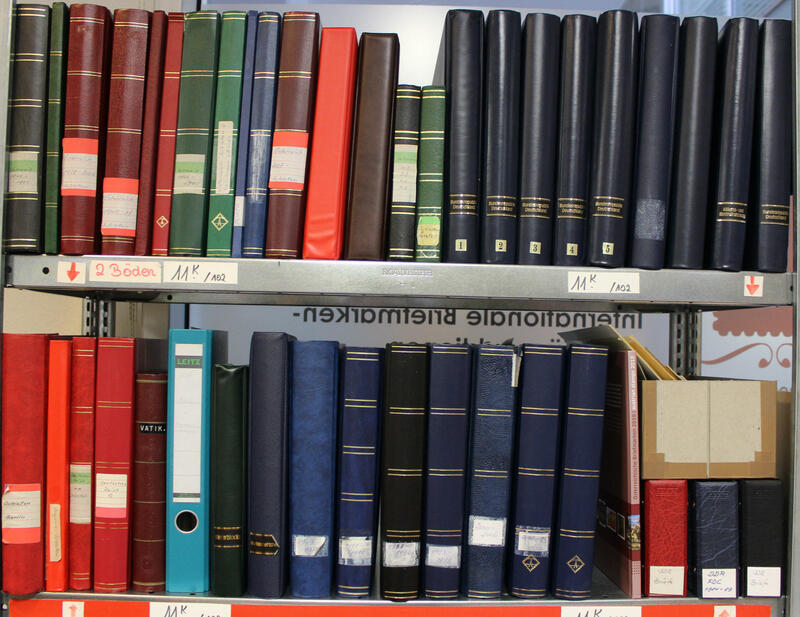 As well a nice and extensive part Switzerland, as well many further countries from Europe and oversea, German Demokratic Republik (East Germany) with numerous first issues and so on. Please check carefully!